Once you have finished your scarf it’s time to block. I always block my knitting before weaving in the ends. The fabric can change with blocking and you wouldn’t want your ends to start trying to get out! Why block? I have a confession: I never used to block my knitting. It seemed fussy and unnecessary. What real difference could a little water and laying your knitting flat accomplish? Boy was I wrong. I’m a big convert to the world of blocking (thank you Emily) so I hope you will be too. Blocking consists of wetting your knitting and laying it flat, the way you want it, to dry. When you block things like lace it can get a little more complicated but that’s the gist of it. Your stitches will look smoother and more even and if you have changes in fabric (like garter to ribbing for example), it will help to even these changes out. So let’s get blocking! 1. Pins: I use T-pins (they are literally shaped like T’s) but any stainless steel pin will do. 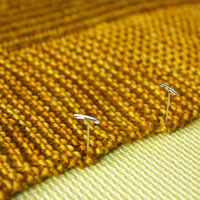 You want to make sure that your pins won’t rust because rust and knitting are not a good combination. 2. Something to block on: I bought these foam puzzle pieces at the hardware store but a piece of cardboard will do fine. 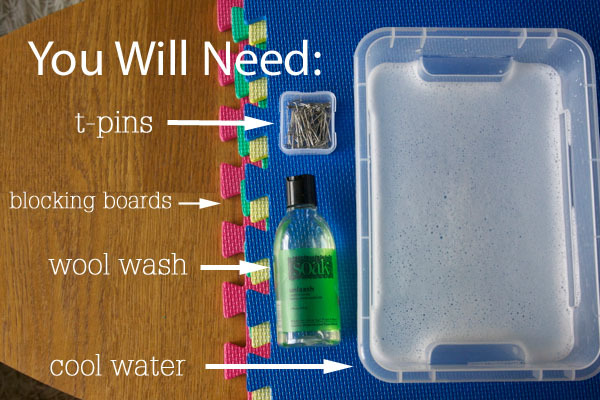 You just need something to stick your pins into that will allow your knitting to dry. 3. Wool wash: something like Soak or Eucalan are popular wool washes. Read the label to see if you need to rinse your knitting or not. Soak is a leave in wash and a squirt the size of a dime will do for a scarf. 4. 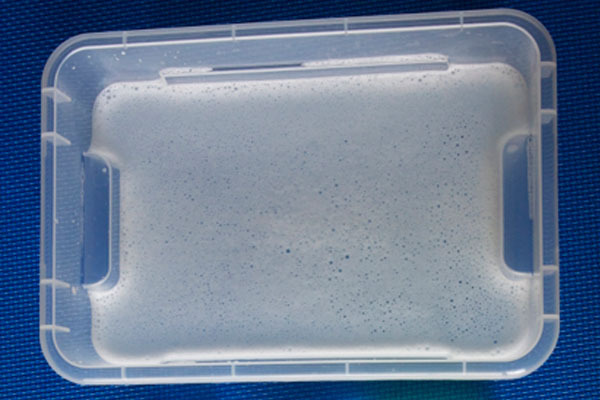 Something to soak your knitting in: either a clean sink or a clean basin. Emphasis on clean! 5. A towel: this is to squeeze out any excess water from your knitting. 2. Wet your knitting. I do this by submerging my knitting and pressing out the bubbles. You don’t want to agitate your knitting too much. Leave it for about 15 minutes to get it good and soaked. 3. Take your knitting out of the water and press out as much excess as you can. Do not wring your knitting, this can put it out of shape permanently. 5. 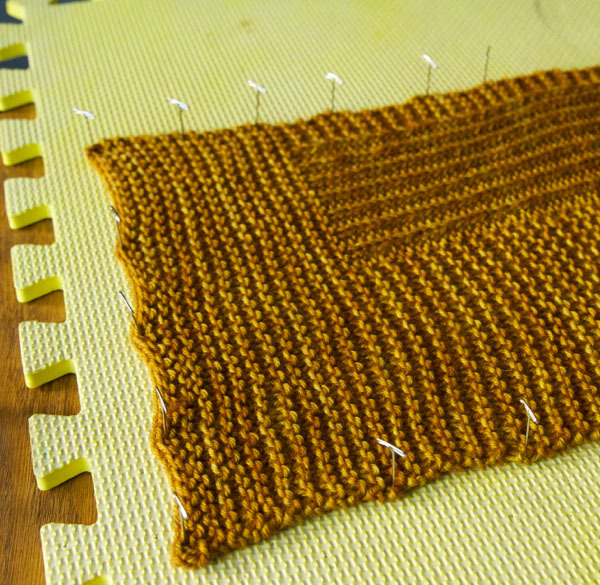 Lay your knitting out on your blocking boards and using your hands push it into shape. You want to lay your knitting out just the way you want it to look. For a scarf you need to create an even width and straight edges. Pin into place. Your knitting should dry in a day or 2 depending on the climate (I love blocking outside in the summer, it’s so quick!). If your knitting takes more than 3 days to dry, start over. Your knitting will have a not-so-fresh smell to it. Try again, this time squeezing more water out before pinning. This is basic blocking, but there other, more exacting, ways to block your knitting. How you block your garment will really depend on what it is and what sort of fabric you have. You might not use pins for a sweater (unless it has lace or cables) or if you are blocking a lace shawl you might want to use blocking wires. While blocking may seem fussy at first it really makes a big difference in the finished product. You spend so much time hand knitting, what’s a day or 2 for a block? Love your detailed instructions especially with links to other items of interest such as a stitch. Really enjoying your Barley Hat in cotton as a chemo cap gift. Thank you!!! Blocking can solve a lot of problems! When it doubt, block it out! Hi dear. Can you speed up the wet blocking process by steam ironing over a wet towel and then pin it? Hi Tamika – you can, but I don’t particularly trust myself with an iron, steam, and my knitting. The wrong move can be a recipe for felted disaster! I would lay it flat to dry (as I would with any knitwear), but I only really block my shawls once a year or so. It doesn’t need to be blocked each time. If it was knit with wool, you won’t need to wash it every year. And blocking is not always needed, but only when it needs to be re-shaped. Blocking means to use moisture to give it shape. You can just lay flat and make smooth with your hands, stretching when necessary. Lace does benefit from stretching out as much as possible. This is NOT a very difficult job! How should I block my Flax? I’ve updated the link in the post as well, it seems it was a little out of date! Knitted my scarf but after blocking it ended up longer. Is there anything you can do to shorten again or can you take stitches out after blocking to shorten? Hi Kathleen – you bet! You could try blocking it again and making sure to block it at the dimensions you like first, but if that doesn’t work you can take ’em out! Hi! I’m currently knitting the Winding Way socks, and I want to know how to block lace socks. I don’t actually have sock blockers, so what I do is I use towels that are folded up to be thicker (usually one, haven’t knitted anything that big yet), and pin the piece out using stainless steel plastic head pins I got from my mom’s sewing drawer. I know lace needs to stretch out usually, but how should I go about this blocking socks? Yes, you can use that rolled up towel as a blocker for socks. Or you can lay them flat, and pin them out, if you wish. Yes, lace benefits from being stretched out as much as you can, but with socks, you don’t have to. After washing, just lay them flat, smoothening out as much as you can. You will stretch them further when wearing them! My sleeves are separate. They are about 1″ too long, do I just scrunch them up , re wet, or blow dry shorter. This is my first sweater blocking experience😜Help!! Should I block a sweater knitted with Linpur linen yarn? All knitting, and I mean ALL your knitting, MUST be blocked to call it finished. Without blocking, you are missing the most important step of all that work! Blocking will improve your knitting 120% and you will look like a professional. Don’t skip this most important step!! Should I sew the buttons on my sweater before or after I block? I’ve already woven in the “ends” so I hope that won’t be a problem. I’ve knitted for years and years and have never blocked before but I think this latest project needs blocking. Hi Rhona – I usually block before I sew my buttons but I’m not sure it matters. My sweaters get a re-block every year and they have buttons on them! where do you buy blocking equipment? I have some blocking wires and pins I’ve picked up at my local yarn shop, but my mats are from Canadian Tire, lots of hardware stores or baby stores have them! my question (do you need to block acrylic yarn) got answered! I am knitting the Snowflake pullover and I am wondering about whether to block the lace yoke before joining round. Any tips please? Is it necessary? Or will the lace open up sufficiently if I only block the finished garment. The thought of blocking and pinning with all those live stitches makes me nervous! (In case it’s important to know, the yarn is a wool/bamboo blend, nice and squishy – I’d hate to damage it). I was looking for some advice on blocking a large circular shawl. It’s 64in in diameter. The problem is that there is no carpet and the biggest bed available is a twin size. Could I try blocking it on the hardwood by taping (scotch tape, masking tape, duct tape) it into place? It’s a pretty sturdy wool, so I doubt scotch tape or masking tape would hurt it, but I was wondering if you knew any other way or if you’d heard of anyone trying this method. I can’t seem to find anything on the web for blocking such a large item without a big enough bed or carpeted floor. Hmm, a logistical question. I might try masking tape if you don’t think it will hurt the wool. I am finishing a sweater that I inherited from my great great great aunt and it is all in pieces (front, back, sleeves). Should I block the pieces first and then stitch them together? I would still need to finish the yoke and lapels once together since it is a button up.They are done in a super bulky yarn in k2p2. I am confused in which order I should be blocking, stitching together, and finishing it. Thanks. Hi Jen – I understand the confusion, which order to do those things is definitely a matter of debate among knitters. I would say, block the piece, sew them together, add the button bands and collar, then block the whole sweater. I am knitting a dish cloth with cotton yarn. I see some small spaces ( just a little loose). Should I block it and if I do, will it look better and closed spaces? I Just finished a sweater knit in a tube in a garter rib stitch. I’m not sure how to block it to even the stitches out. Could you please advise me? I think I would block it like any other sweater (sweater blocking tutorial here), I’m not 100% sure what you mean by garter rib stitch? I block with my steam iron. Is this method better? Blocking with steam can work well too, we just prefer to wet-block because it is very effective and thorough. Also, it is the method you will use after you hand-wash your knits. I’m not aware whether adding lanolin will soften a wool scarf. I have heard that using hair conditioner can help. Sorry I also have very little experience blocking acrylic. I don’t believe wet-blocking will have much of an effect, but I could be wrong… You’re probably more experienced than I am in that regard. I’d simply try it and see. The edges of my croched scarf roll up…Is there some way I can flatten that area without blocking? Not really! I’d suggest you try blocking. Some kinds of stitch patterns in knitting and crochet have an innate tendency to roll, and blocking can help with this, but the fabric will eventually roll, it’s just a matter of time, with these kinds of patterns. When should I sew buttons on my Antler Cardigan – before or after blocking? Hi Katie – I usually do it after, when my button bands are blocked and even. Hello, thanks for all the tips and tutorials you post, they are really helpful. I knitted the MALT blanket but it’s not the first time I had a problem while blocking. I think the stitches ar too stretched and I can see the carpet underneath through them. I’m afraid it will not be as pretty as it was before I blocked it.Do you have a tip for avoiding over stretching? I don’t know if I’m clear enough, english is not my first language. Hi Marjorie – When you are blocking you want to make sure you are laying your item flat, not stretching it (lace is a bit of a different story). 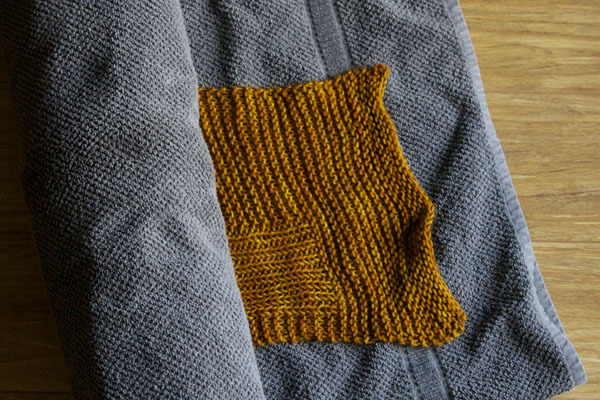 Since Malt is a worsted weight blanket it can get pretty heavy when wet so you want to make sure you squeeze out as much water as possible, it will probably take rolling it in a towel and squeezing out the water a few times to really get the bulk of the water out. When you lay it out try not to stretch it, if it does seem too stretchy try to smoosh it back into place. one more thing please …pattern instructs me to join shoulders and pick up sts…before or after blocking? Well, as a rule, I don’t think you can possibly ‘over pin’ so maybe 1.5 inches apart? Pinning will straighten some things out, but if it’s a stockinette edge it will still roll a bit, it’s the nature of the fabric. If you want a straight edge I would do a garter st or ribbed border. I did not notice any instructions regarding raised stitches such as cables but do you block the garter stitch borders? #2. You say press out the bubbles.please elaborate. I’m not quite sure how to elaborate. You are literally pressing on the garment so the bubbles come out. How do you press out bubbles when your knitting is submerged in soapy water? Hmm, I’m not sure what you mean, I usually use a wool wash that doesn’t need to be rinsed out and press with my hands. Does that help? 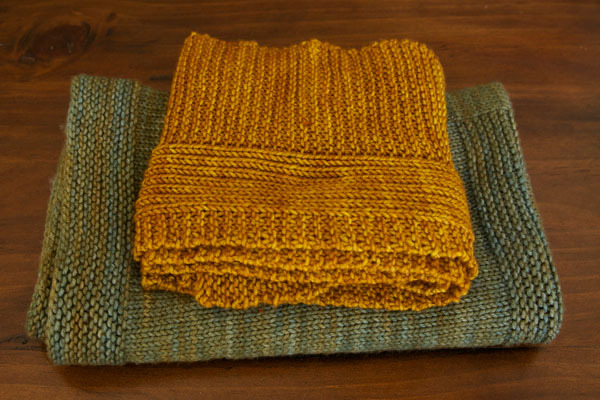 If you are knitting a wool cowl and it has a design “roll”on each end, how do you block it? Do you”unroll” it and pin it??? Or do you leave the roll? If you pIn it straight will the “roll” snap back when dry? It doesn’t really matter too much, since it will roll back no matter what you do. I would pin it out to even out the sts. Instead of stomping in a ‘towel protection’, couldn’t you protect it in a pillowcase and spin it? I wouldn’t, tends to mash up your knitting and sometimes it stretches different parts in different ways. For a 2 month infant, I made the Moderne Lincoln Square blanket. Can I wash it in baby Dreft detergent and since I am a little nervous about blocking 34″ by 30 blanket I was thinking of then having a knitting store do it. What are suggestions? What yarn did you use? If it’s a washable wool you can wash it in the machine and I would lay it flat to dry. If it is a wool you should hand wash for sure. Basically you will want to follow the washing instructions on the yarn and I recommend laying it flat to dry. I’m making your Wheat scarf right now. I’ve never blocked my knitting before but will definitely give it a go this time around. Thanks for the clear instructions. Hi and thanks! How do you block 3D things like a hat, sweater, or Möbius cowl, though? Yep, I block EVERYTHING! There was a time when I thought it was a waste of time but I am a huge convert to the world of the block. I usually just block my hats flat but if it’s a beret or lacy I will block it over a plate or bowl. The sweater or Mobius cowl I would block flat. Thank you for all this advice! I have been knitting for over 20 years and like you at first…why block? Now I do too…really helps and I have always used the towel method, never in a washer…no no. Hi, great post! Just wondering, is it absolutely necessary to use a wool wash if the fibers aren’t animal-based, e.g. acrylic? Are there any alternatives or home-made solutions? If you have acrylic blocking won’t make a difference so you can skip it altogether! So…If I use acrylic yarn I don’t have to block? Or…If I use acrylic yarn I don’t have to use a softener? Hi Carla – I don’t really know too much about care for acrylics. They don’t have ‘memory’ like wool, so I don’t think blocking will really do anything. I would definitely give a finished item a wash regardless. Check the instructions on the ball band too! Hi! Thanks for the tutorial! I was wondering if we have to do blocking only once or if we need to do it each time we wash the knitted sweater, for instance. I would block it carefully the first time and always lay it flat to dry myself. So you are sort of blocking it each time. But lots of people use washable wools they toss in the dryer so it’s knitters choice! Great tutorial – thanks! Dumb question – why would you not want to use pins for a sweater? It really depends on the sweater. If it has lace, for example, or if I need a little extra length or width etc. then I would use pins. Otherwise, on a simple sweater, I would just be blocking to smooth out the stitches so no pins required. OK, I think I understand. Thanks very much! Where do I buy a blocking board? Your LYS is great if you have one. Otherwise you can use a piece of cardboard or I use foam puzzle mats, the kind they have for kiddies, the hardware store will have these.